(VOVWORLD) - Recently, many listeners have visited our website to listen to our programs online. They have some questions. Ethan Best wants to know if there is an RSS feed for the English language programs. “It would be very nice to have the latest programs available in my RSS feed reader”, Ethan said. B: I’m afraid that function is not yet available on our website, but we’re trying to add capabilities to our service to make it more convenient for our listeners. A: Karuna Kanta Pal of India told us that normally he listens to our programs via internet radio, which is very clear with excellent reception. He asked if QSL cards are provided for internet radio listeners. B: Currently we didn’t provide QSL cards for online reception reports. We’ll propose the idea to our boss since so many of our listeners now listen online. Karuna said he sent emails to VOV and they were aired immediately in the Letter Box. But he didn’t receive QSL cards, postcards, or a New Year calendar. A: We checked the list of New Year’s gifts sent to listeners and your name was on the list. We’re sorry to hear you haven’t yet received your gift. I presume it got lost on the way. We’ve sent you another calendar. Hopefully, you’ll get this one along with QSL cards for your recent reception reports. 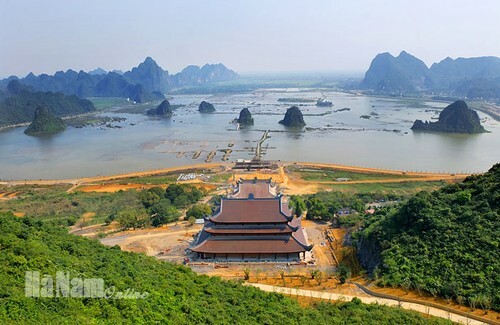 An other view of Tam Chuc pagoda in Vietnam, which will host the UN Vesak 2019 in May. B: Kanchan Kr Chatterjee of India told us that members of his shortwave listeners club love to listen to VOV for information about Vietnam’s culture, society, politics, international relations, economy, business, personalities and much more. They want us to hold a VOV Radio Quiz Contest. They’re sure many listeners will want to participate. A: Thank you for the suggestion. VOVWorld holds a contest called “What do you know about Vietnam?” every 5 years to test listeners’ understanding of Vietnam after listening to our broadcasts. Listeners of all 13 languages broadcast by VOVWorld participate in the contest. 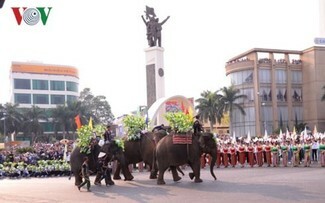 The top 3 entries win free trips to Vietnam and there are many consolation prizes. The next contest is scheduled tor 2020. We’ll think about organizing a quiz more frequently. 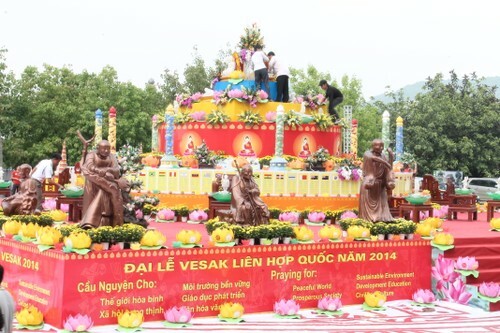 Vietnam hosted the UN Vesak Day in 2014 at Bai Dinh pagoda. B: Sujan Kumar Barua, Secretary General of the Bangladesh Buddhist Academy said he’d like to join the UN Day of Vesak 2019 and wants to know how to apply. A: Rupan Barua of Bangladesh said he attended the UN Day of Vesak-2015 in Bangkok. He is eagerly waiting to attend the next event in Vietnam in May. 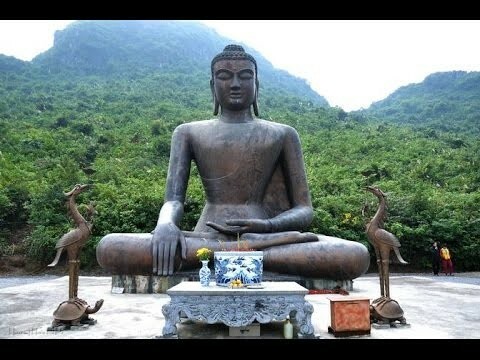 B: The National Vietnam Buddhist Sangha will host the 16th United Nations Day of Vesak celebrations and international Buddhist conference in Ha Nam Province from May 12-14. More than 10,000 people will attend the event, including heads of states, Buddhist leaders, and scholars, and Buddhists from 100 countries and territories around the world. Buddha statue at Tam Chuc pagoda. A: If you are interested in attending the celebration and international conference, contact the Buddhist Shangha of Vietnam. 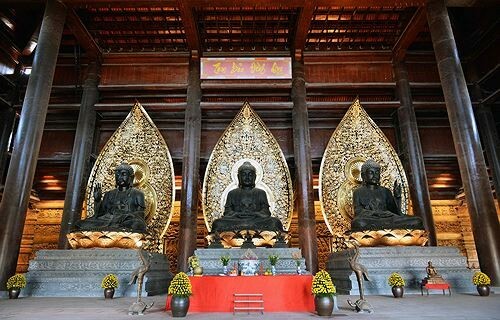 Before, during, and after the event, Tam Chuc pagoda, which will host the Vesak celebration, will be open to visitors. 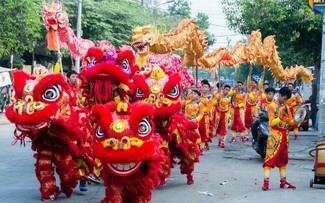 We hope you’ll have a chance to visit Vietnam and attend the event. B: Karuna Kanta Pal of India wants to know about Vietnam’s iron and steel industry. A Research Report on the Vietnam Steel Industry 2018-2022, by Research and Markets, the world’s largest market research center, said that as Vietnam's economy develops and the living standard rise, demand for steel in industries such as construction, automobiles, and home appliances is also increasing. A: The rapid increase of steel demand has promoted many steel companies to build new steel plants in Vietnam. Seeing the huge potential of the steel market in Vietnam, many enterprises have invested in steel industry in recent years. 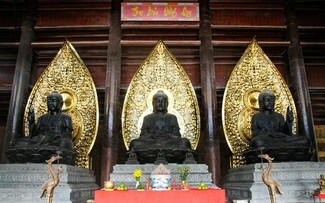 Buddha statues at Tam Chuc pagoda. B: There are more than 100 companies in Vietnam's steel industry, including Hoa Phat Steel, Hoa Sen Steel, Vietnam Steel Corporation, and Formosa Ha Tinh Steel Corporation. Steel companies have been set up in many industrial parks in Vietnam, which enjoy low taxes and other advantages. A: Most of the domestic steel manufacturers have low production capacity and outdated equipment. Foreign-funded enterprises see great prospects in investing in Vietnam’s steel industry of Vietnam. B: Several of iron and steel projects will be put into operation this year, including the Hoa Phat Group’s steel complex in Quang Ngai province with a total capacity of 2 million tons per year, the Hoa Sen Group’s cold rolled steel production line in Binh Dinh province with a capacity of 350,000 tons per year, and three construction steel projects belonging to Pomina, Vietnam-Italia, and Tung Ho-Vietnam Steel Corporation, which will produce over 1.8 million tons a year. B: That’s a brief synopsis of Vietnam’s steel and iron industry. Now let’s read reception reports from other listeners. Muneer KP of the United Arab Emirates emailed us a reception report for a program on March 16th on the frequency of 7220khz at 16:00 hours. The SINPO rating was 43433. There was good signal strength but strong interference, especially at the beginning. A: Pravotorov Kostiantyn of Ukraine tuned in to our program on 7220 khz using a Grundig WR 5405. He rated SINPO at 35343. B: Thanks, listeners, for keeping radio alive by turning on your radio every day. And thank you for supporting VOV. We welcome your feedback at English Service, VOVworld, Voice of Vietnam, 45 Ba Trieu Street, Hanoi, Vietnam. Our email address is englishsection@vov.org.vn. Goodbye until next time.